Lemax Village North Pole Signs Set of 2 depicts two individual standalone snowed Christmas signs to compliment your Winter miniature village display. Scaled and themed for placement in and amongst a Lemax Santa's Wonderland themed miniature village scene. 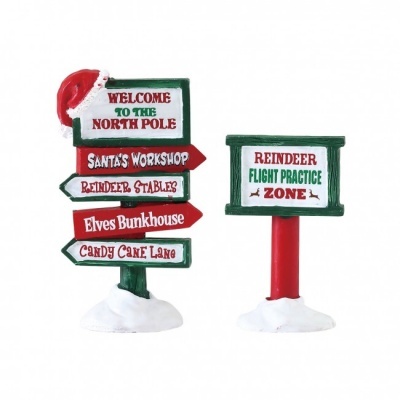 The North Pole signs are of polyresin construction and self standing. These two north pole signs only recently joined the Lemax Village collection in 2018.